A few days ago, a friend mentioned to me that someone we both know had been laid off. “There are a lot of walking wounded out there” she commented. What followed was a thoughtful discussion about the difficulty of moving on after a lay-off. In a lay-off, individuals lose the ability to leave on their terms and in their own time. It seems to take away their most important human right: choice. Accordingly, there is a feeling of powerlessness and lack of completion. Although a lay-off is often not retractable, there are some things an ex-employee can do to make it manageable. It is important to “ritualize” the ending, to have an event that denotes the ending. This allows the person to feel more in control of the ending. It allows the ending to be distinct and traceable. Most important, it provides an opportunity to create a more positive association with the ending, as it is difficult to follow a bad ending with a good beginning. Try to think of ways to ritualize the ending so that you are guaranteed a good beginning. 1. Plan your own going-away party to thank your co-workers and say goodbye. Invite only the people you care about. If money is an issue, plan a potluck lunch or dinner in your home. 2. Accept that sadness or feelings of loss are normal. By not dealing with these feelings, you may invite them to stay longer. 3. Re-define the ending. Put a positive spin on it. “Losing this job gives me an opportunity to take the time to find out what I really want to be doing.” Take advantage of this time to search your heart and follow your passion. 5. Finally, don’t get bogged down in thinking, “This is a terrible time to be out of work.” Remember that economic trends are cyclical. Hang in there. During difficult times I find it best to remember that I have always grown from changes and that the journey is as fulfilling as the goal. This may be the opportune time to realize and achieve your goals. Jill McGillen, president, Next Turn. Next Turn is a coaching and training firm specializing in career planning and professional development. 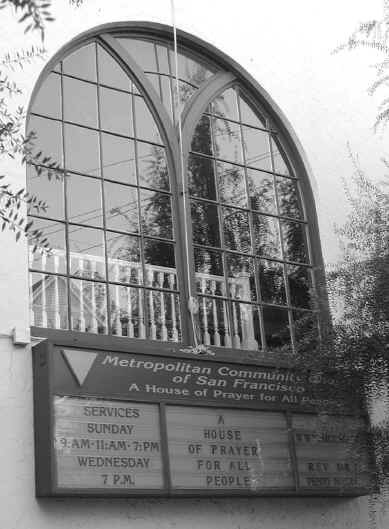 The Metropolitan Community Church sits on a quiet side street in the Castro. On a fall day its lavender façade glows softly against the surrounding greenery. If you walk by on a weekday afternoon, you’re likely to hear the sounds of organ music bursting through the open door. But if you paid MCC a visit last Sunday, Veterans’ Day, you probably encountered a very San Francisco celebration. Or rather, two celebrations, one in the morning and one at night. Each made its peace with the day in its own way. MCC is decidedly ecumenical, with study groups devoted to Judaism intermingled with lectures on Buddhism. The Sunday morning service chose the latter — a focus on the Buddhism. The evening service faced the day head-on and invited it to join the congregation. Douglas Fitch, from Glide Memorial, preached; the occasion was a “litany of honor for those who served in the United States military.” What a pity that a few Washington types couldn’t have dropped in. To be sure, it’s a grand old flag. What do Antonia Manor, the Cadillac Hotel, and the Knox have in common? They all send representatives to a group known as TAC. So do dozens of other buildings inhabited by low-income renters. The Tenant Associations Coalition of San Francisco is a community-based organization working to assist residents like these — whether families, single adults, disabled individuals, or seniors. At its monthly meetings, the members often ply visiting dignitaries with questions about ways to improve their living conditions. But on Thursday, November 8, the tables were turned. It was the members turn to shine. The place was the Tenderloin Police Station; the occasion was TAC’s third anniversary. Awards flowed like honey, from the Board of Supervisors, the mayor, Senator Dianne Feinstein, the Housing Rights Committee of San Francisco — to TAC itself, founder Michael Nulty, his brother John Nulty, neighborhood activist Susan Bryan, and more than 60 other tenant leaders. But some people are never satisfied. So it is with this group, which professes a strong determination to end its tenant status and work toward home ownership. And thus accomplish its own abolition. It must be museum time in San Francisco. The de Young is rebuilding; so is the Asian. Jews and Mexicans are looking forward to splendid new space South of Market. So it’s about time that Chinese Americans left their longtime Chinatown cubbyhole and moved into a place they can be proud of. The Chinese American National Museum will occupy the old Chinatown YMCA, designed by Julia Morgan, at 965 Clay. At last there will be room to display a large number of the 50,000 pieces of art, artifacts, photos, and immigration documents that have been accumulated over the years, and also offer special exhibitions of artists such as Dong Kingman. Expect the sounds of excitement to issue from this section of Clay on the weekend of November 17-18, when the building is being dedicated properly, with puppet shows, storytelling, and a variety of other performances. Perhaps the happy hubbub will exorcise some unhappy ghosts. Says Melissa M. Szeto, executive director of the Chinese Historical Society of America, “We hope the museum and learning center will help dispel the myths and misperceptions of the Chinese still held by many Americans.” For more information, call 415 391-1188. 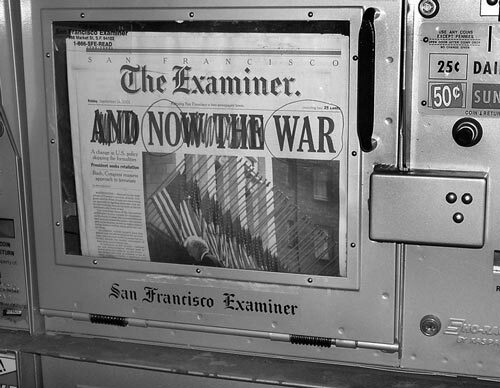 If you turn to almost any Indymedia website, you’ll run into a black-and-white photo of a San Francisco Examiner newsrack. But like all good art, this piece has taken on a life of its own. The irreverent folks at Adbusters.org have adopted it as part of their Jammers Gallery. In an item titled “Urban Jumble,” they exhort, “Upset with the voice of your local paper? Grab a pen and become a street-level headline writer, like this Bay area ‘scribe.’ For the low cost of a few quarters, you too can make your foray into front-page news.” Move over, P.J. Corkery.